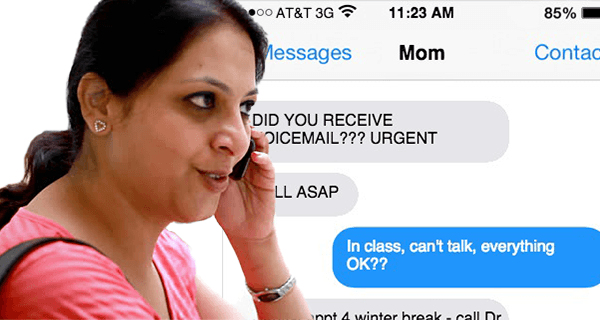 Isha Chaudry, 53, reported this week that she “couldn’t wait” to leave her daughter a voicemail and then subsequently transcribe the entire voicemail in a series of 8 text messages. The Merrimack, New Hampshire woman and mother of three was reportedly “ecstatic” to find as many ways as possible of reminding her 19-year-old daughter Mira about the need to schedule an upcoming dentist appointment. “Well, I’m definitely going to try her cell while I know she’s in her Physics lecture – that way I don’t run the risk of her actually picking up the phone,” said Chaudry. “Then, when she hasn’t responded within the next forty minutes, I’ll send her a panicked text message that will read something along the lines of ‘DID YOU RECEIVE VOICEMAIL???? URGENT, CALL ASAP,'” she continued. Chaudry – who plans to also forward her daughter the receipt from her previous dentist appointment two years ago with a mysteriously BCC’d reply that says only, ‘DID YOU RECEIVE?’ – is currently contemplating the best way to divide up the eight part mini-series.